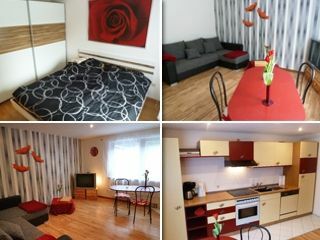 We offer an idyllic, bright and modern equipped apartment. The 2-bedroom apartment offers 40 sqm living room and a fully equipped kitchen, a bedroom (double bed with 2 x 90x200cm) and a bathroom with shower and toilet. Satellite TV and wireless Internet access (free). Terrace and parking space. Price per night (up to 2 persons): 39,00 EUR. Price per night (up to 3 persons): 55,00 EUR. Children under 12 years free. Arrival from 14:00 clock, departure till 11:00 clock or by appointment. The apartment is located about 15 minutes north of Überlingen on Lake Constance in the holiday resort cane field in Herdwangen district Kleinschönach. Motorway A81 Stuttgart-Singen: o Turn AB Hegau on the A98 direction Stockach o to Stockach the A81 merges with the B31 o B31 until you reach the roundabout in front of Überlingen, take the 3rd exit towards Owingen o straight to stove cheeks, where you turn right towards Kleinschönach o after about 4 kilometers from the cane field Take the entrance next to the bus stop (in the valley) to retract into the residential floor box. Take the 5th street on the left (dead end). The first house on the left is their goal.